The KidKraft Kitchen set range provides a wonderful world of imagination, creative play, and life skills training for your little kitchen helper! Buying any of the KidKraft kitchen items has never been easier from single appliance pieces to entire full-service toy kitchen models. Your child will feel like a real chef when he whips up a mix juice or “bakes” a batch of christmas cookies for Santa. All the proportions of these KidKraft Kitchen toys are made for young children in mind which make the experience more fun and realistic as well. Choose a KidKraft Kitchen toy for your child, and watch his or her creative mind grow while learning about kitchen safety, nutrition, and basic cooking techniques. KidKraft Kitchen toys provide hours of entertainment and can be stored neatly away in your child’s toy chest or closet. KidKraft has a fascinating history when it comes to toy kitchens. Some of their landmark kitchen sets are outlines below. Please note that some of these play kitchens are no more available in the market. Bon appétit! It’s time for the kids to cook up some creativity cookies with our classic kitchen! Painted in bright pastel colors,KidKraft Large Kitchen will impress every kid who spots it. 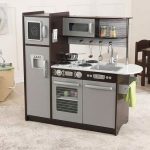 This play kitchen showcases a tall interactive toy refrigerator, toy freezer, toy oven and life like toy microwave which they all can open and close easily. The play safe see-through doors on oven and microwave make it easy for kids to find thier kitchen items and a removable sink for quick and easy cleaning, which is the best feature! Knobs on the oven and sink are realistic. It has a large convenient storage above and below the sink for all those kitchen extras. This play kitchen is constructed very well and can handle day to day wear and tear. The paint is all non – toxic and safe to play with. The little ones will feel just like mom and dad or a chef when they cook up fun with the Deluxe Big and Bright Kitchen from KidKraft. This wooden play kitchen is cute, colorful and built to last! 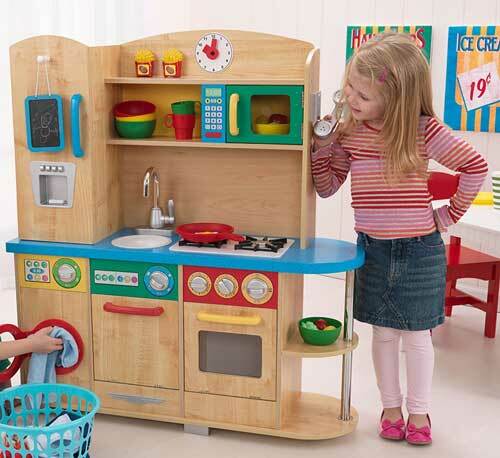 The features of this toy kitchen: -Bright multicolored finish -Made of wood. With this Deluxe Let’s Cook Kitchen, kids can cook up a feast without getting a single dish dirty. This adorable pretend kitchen is one gift all the young chefs in your life are sure to enjoy. Convenient storage above and below the sink for all the extra kitchen appliances and kitchen utensils. This kitchen toy set is large enough that multiple children can play at once and is made of wood so it can handle the every day knocks. Young chefs will love cooking up feasts for the whole family with this adorable wooden kitchen. The toy vintage kichen set is such hit with so many people. That often they sell out in the high season of Christmas so try to get one as soon as you can if you are after one of these toy kitchen sets. The red vintage kitchen has some great features like a toy ladle,toy pot and fancy dress apron, all the doors open and close with easy and the realistic oven knobs make clicking sounds when turned. It comes with a cordless toy phone to talk with friends, a removable sink for easy cleanup, this fantistic toy kitchen is constructed from wood and is very sturdy. Kids will love being the head chef with the Silver Retro Kitchen. With fun retro colors, detailed design and interactive features, such as the oven and dishwasher open and close, the knobs on oven, dishwasher and sink turn and the removable sink is easy to clean. The beautiful high-gloss, chip-resistant finish on the Retro Kitchen by Kidkraft is sturdy and large enough that multiple children can play at once. The Silver Retro Kitchen is made of wood and comes packaged with comprehensive, simple-to-understand assembly instructions. Kids and adults will have a great time when imaginations start cookin’ up some fun. Cooking and creativity come together in this toy. Perfectly sized for kids, this kitchen is great for imaginative play and let’s-pretend. Finished in Primary colors our island kitchen has tons of features and a compact design. Feed your little chef’s passion with the KidKraft Prairie Kitchen. Treat your child to a world of culinary play in this elegant, white and natural-finish pretend kitchen and enjoy the masterpieces the kid cooks up! It also has a removable sink for quick and easy clean-up. This kitchen toy measures approx. 37H x 30W x 13 and it has a solid construction made of wood. This toy is recommended for for children older than 3 years. KidKraft Cook Together KitchenGet out your chef’s hat and apron, because it’s time to cook up some fun! The KidKraft Cook Together Kitchen is perfect for any young chef who loves to help mom and dad in the kitchen. It would make a great gift for any occasion: Christmas or birthday. It features the whole range of accessories: refrigerator, dishwasher, oven, microwave and washing machine doors that all open and close and a removable sink for quick and easy cleaning.